Use-of-force procedures for law enforcement and security forces worldwide continue to expand their reliance on less lethal devices as an early option. Laser Shot’s comprehensive approach prioritizes simulated less lethal training aids alongside our simulated firearms as part of our full spectrum law enforcement training solutions. 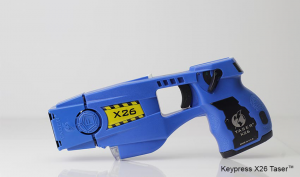 Simulated X26 Tasers™ begin as real less lethal weapons that are disassembled and rebuilt with Laser Shot technology to integrate wirelessly with firearm simulators to provide trainees a realistic gamut of use-of-force options. When the Simulated X26’s trigger is pressed, characters in select HD scenarios will react as if a Taser™ has been deployed. Designed to match the dimensions of standard-issued OC Spray devices, this simulated version integrates wirelessly with Laser Shot simulators to provide trainees a realistic gamut of use-of-force options. When the trigger is pressed, characters in select HD scenarios will react as if OC Spray has been deployed.